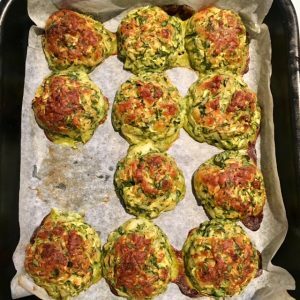 Carly Personal Trainer | NOW YOU’LL ALWAYS WANT TO EAT YOUR GREENS! NOW YOU’LL ALWAYS WANT TO EAT YOUR GREENS! As the weather gets nicer, I have been thinking of a fresh yet comforting dish, which can help through these last winter days. And I came up with this super delicious and nutritious vegetarian dish, that can be eaten hot or cold. You can make it with any kind of pasta depending on your diet and preferences. I prepared it with quinoa pasta, which is a great gluten free alternative and a good source of protein. It is also nice with whole wheat pasta or buckwheat spaghetti, which is another gluten free option. 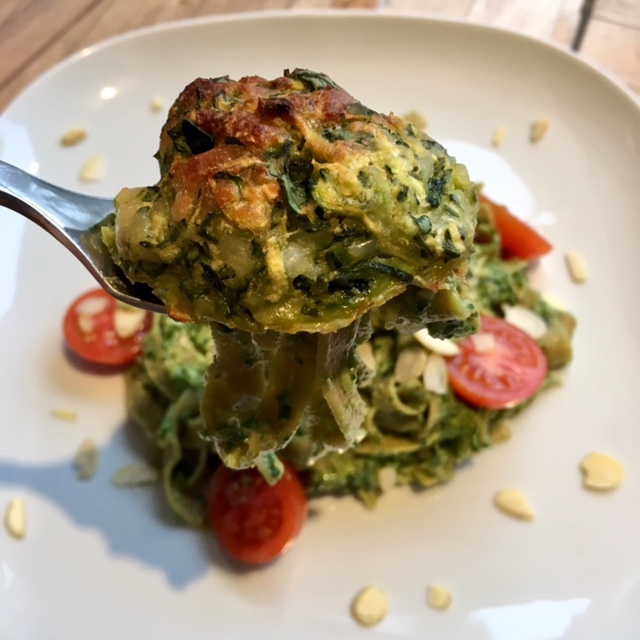 If you want a low carb dish, however, you can even then have it with courgetti (courgette spaghetti), it still will be delicious. This dish is not only good for your taste buds but also great for your whole body. Avocado is incredibly nutritious, it is loaded with healthy fats, fibre and various important nutrients. Eating avocado with veggies can dramatically increase the amount of antioxidants you take in, as the fat in them can help you absorb nutrients from plant foods. Spinach is a winner for increasing physical strength, as it is rich in iron and the dark green colourof the leaves indicates they contain high levels of chlorophyll. It is also an excellent source of vitamin K, vitamin A, vitamin C and folic acid as well as being a good source of manganese, magnesium, iron and vitamin B2. Vitamin K is important for maintaining bone health and it is difficult to find vegetables richer in vitamin K than spinach. 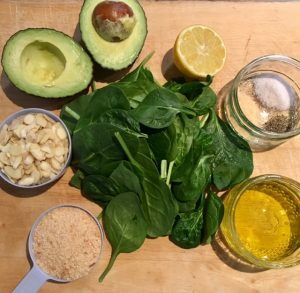 It is a fat soluble nutrient, so eating the spinach together with the avocado will help your body to absorb this important vitamin. Almonds are high in healthy monounsaturated fats, fiber, protein and various important nutrients, and a good source of antioxidants. Courgette is one of the very low calorie vegetables so a fab veggie for those looking for weight loss. It contains no saturated fats or cholesterol. Its peel is a good source of dietary fibre that helps reduce constipation, slows digestion and stabilises blood sugar levels. They also contain significant levels of potassium to control blood pressure and vitamin C to boost your immune system in these cold months. 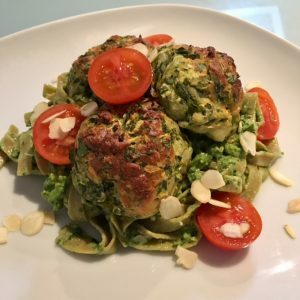 I advise you to start with the courgette balls, as they need a bit of time in the oven and during the time that they’re baking, you can then make the pesto and cook your choice of pasta. First grate the courgettes on a course grater and sprinkle with salt, then leave to rest for 10 – 15 minutes. This step is VERY important, as it prevents the balls from being to be too watery. Then with your hands squeeze out as much water as you can, and transfer it to a bowl. Add the rest of the ingredients, and mix well with your hands. Roll medium size balls and then put them on a baking tray lined with parchment paper. 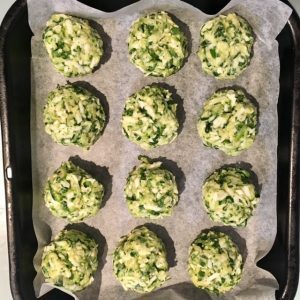 I made 15 balls from this recipe so adapt to your quantity. Now they can go in the 180C preheated oven, and leave to bake for 35 – 40 minutes, or until golden brown. While the balls are baking, you can make the pesto. Place all ingredients in a food processor and blend until almost smooth, but still remaining a bit chunky. This makes a good amount of pesto, which you can also use next day. Prepare the pasta and mix it with as much of the pesto as you like. I like to use a generous amount myself! 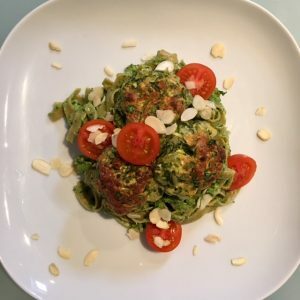 Plate it with the courgette balls, garnish with cherry tomato halves and a sprinkle of flaked almonds. And there you have it!